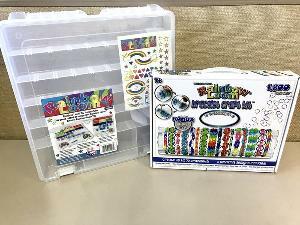 Prize: Within this kit you'll receive the Rainbow Loom, the Mini Loom, over 1,800 rubber bands, over 75 c-clips, and a bracelet display rack. What you must do to enter: You can enter 5 times a day, so return often to improve your chances of winning. Statistics: This contest was opened by 125 and entered by 5 ContestChest.com members. 4% of those who opened the contest, entered it.